Since I live alone, am slightly disabled and have trouble cooking, the toaster oven is a life saver. Sometimes I don't want to turn on the oven to cook something tiny and waste all of that electricity (I have an electric oven). My ex-husband introduced me to the toaster oven about 25 years ago and I have never looked back. Some of them are so big you can actually cook a rotisserie chicken in them. But today I would like to discuss how the toaster oven can be a pleasure, in fact a necessity in today's hectic lifestyle. Toaster ovens are versatile, compact and convenient. They do the job of both a full size oven and a toaster while using far less space and far less energy. They can do so much more than just toast, they can bake, broil, brown and keep food warm. This updated edition includes 125 delicious recipes from Ms. Stephen's previous book (125 Best Toaster Oven Recipes), practical tips and information on various toaster ovens and by popular demand an all-new "basics' section with over 25 easy recipes. All of the recipes are designed exclusively for toaster ovens and include delicious options for any time of day. Wide ranging recipes allow the space and energy saving toaster oven to be used for so much more than just toasting. Toaster oven sales are up 80% since 2000. In 2016, approximately 8.1 million toaster ovens were sold across retail channels in the United States. Some of the new basics include Deli Tuna Melts, BBQ Meatballs, Vegetable Bean Chili and Chocolate Chip Muffins. Still featured are old favorites like Salmon Satays and Stuffed Baked Potatoes. With easy-to-prepare recipes and clear instructions, 150 Best Toaster Oven Recipes is perfect for Students, Singles, RV's and anyone looking to make a delicious meal in their toaster oven. Some of these recipes still require a little preparation on the stove. You just cook them in the toaster oven. It is just like a regular meal you would serve, the cooking device just saves on electricity or gas depending on what kind of oven you use. I can tell you that I made a couple of the recipes, such as the Stuffed Bake Potato and it was delicious. It was easy to make, took very little time to prepare and cooks nicely in the oven, coming out fluffy. I also made spaghetti pie, because it is a nice way to take leftover spaghetti and use it in a different way. I am used to making too much spaghetti because I am used to cooking for four people and now I cook for only one person. So when I cook, it is like I cook for an army because I always cooked leftovers too. Now I have to learn to cook for one now and that it hard to learn to go back to doing again. All in all, for me this is a great book to have and I think it would make a great holiday gift because you could give it to anyone that you know who has a toaster oven and that person would appreciate a more efficient way of using it. Definitely pick this up for yourself if you have a toaster oven, you won't regret it. It is extremely useful information to have amongst your cookbooks. Linda Stephen is a professionally trained chef whose recipes have appeared in magazines and cookbooks. Shge funs her own cooking school, Linda's Country Kitchen. 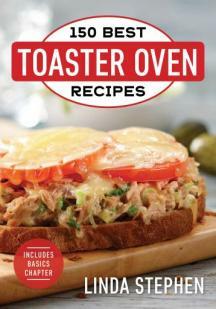 Her book 125 Best Toaster Oven Recipes has sold over 15,000 copies. 150 Best Toaster Oven Recipes (224 pages) retails for $19.95 USA/CAN and can be found online at www.robertrose.ca and www.amazon.com.